The two biggest albums of the year, Travis Scott's "Astroworld" and Drake’s “Scorpion,” have drawn comparisons from fans as they are both long-awaited hip-hop projects from two of the genre’s most-established superstars. Travis Scott photo courtesy of Wikimedia Commons. Drake photo courtesy of Wikimedia Commons. s2018 has been outstanding for music, with major artists such as Pusha T, Playboi Carti, and Ariana Grande adding fantastic projects to their discographies. The two biggest albums of the year, Drake’s “Scorpion” and Travis Scott’s “Astroworld,” have drawn comparisons from fans as they are both long-awaited hip-hop projects from two of the genre’s most-established superstars. 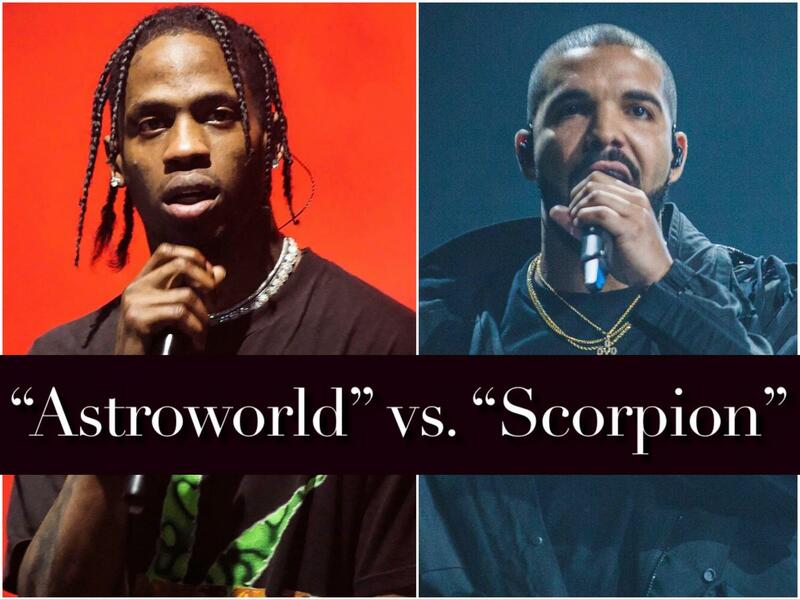 In regard to vocals, “Scorpion” reigns supreme over “Astroworld” as Drake puts on a better rapping performance than Scott. “He doesn’t rely on auto-tune as much as Travis Scott does,” senior Cole Keimig said. However, “Astroworld” surpasses “Scorpion” in its production. “Scorpion” may have expensive and elegant-sounding beats, on songs such as “Is There More” and “Jaded,” but Scott takes production to another level. He pushes boundaries by rapping over unconventional beats, as shown in songs such as “STARGAZING,” “STOP TRYING TO BE GOD” and “NC-17.” They sound otherworldly, with Scott rapping over harmonica cords from Stevie Wonder in “STOP TRYING TO BE GOD.” Other songs, such as “CAROUSEL”, sound like an amusement park experience. “The different melodies worked well together, and all the producers did a good job,” Matthews said. “The production [on ‘Astroworld’] was far more unique than ‘Scorpion,’” Keimig said. Another fantastic aspect of “Astroworld” is the range of outside producers and artists that helped Scott create each song. The 17-track album boasts 30 individual producers, including Scott, who bring their unique talents. Drake’s “Scorpion” only credits 26 different producers for its 25 tracks. “The amount of diversity of producers really helped [the album],” junior Nadine Wetzler said. In addition, Scott features guest artists throughout the album instead of relying on his own talent to carry each song. Featured artists bring a broad range of vocal talent, making each song more interesting. “‘Astroworld’ has better features—they add to each song,” senior Momodou Jah said. “The best features from ‘Astroworld’ are Drake and Gunna,” Matthews said. These artists, along with Frank Ocean, Kid Cudi, James Blake, Sheck Wes, The Weeknd, and 21 Savage, bring additional vocal skills, which Scott may lack, to each song. Despite their differences, Drake and Travis Scott meld perfectly together on “SICKO MODE,” trading off verses on three different beats. Frank Ocean and The Weeknd provide outstanding singing to the tracks “CAROUSEL” and “WAKE UP,” respectively, which serve as much-needed changes of pace from the high-energy tracks that precede them. 21 Savage and Don Toliver add variation to the songs “NC-17” and “CAN’T SAY,” respectively, preventing the monotony of Travis Scott alone. Finally, newcomer Gunna is featured on the song “YOSEMITE,” delivering the hook, fitting in perfectly with the song’s guitar-and flute-based instrumental. “[The features on] ‘Astroworld’ [are better] because of Frank Ocean’s beautiful voice, and every feature has a purpose,” Wetzler said. “Scorpion,” on the other hand, only has four features, with JAY-Z, Michael Jackson, Future and Ty Dolla $ign contributing vocals to songs on the album. Unlike Travis Scott, Drake does not use featured artists to enhance individual songs. Rather, he uses them to attach big names to his album. “‘Astroworld’ had way better features, they were way more unique than ‘Scorpion’’s,” Keimig said. Drake relies more on the natural talent of his voice and rapping ability to carry “Scorpion,” and does not do a lot to craft an album the way Scott does. His only attempt to create an interesting format is by dividing the album into two sides: Side A consisting of rap songs, and Side B consisting of R&B songs. While this distinction is usually maintained, the song “Elevate” is more R&B-centered while “Nice for What” is more rap than R&B. In addition, this seems more like an attempt to gain more album streams and sales rather than for genuine artistic purposes. Overall, “Astroworld” is a better creative, cohesive work compared to “Scorpion.” While Drake may be the more skilled rapper and singer, Scott more than makes up the difference in his decision to include instrumentals and features, which result in a far more well-crafted and consistent album.